Following what was arguably the fiercest battle for victory that Red Bull KTM’s Ryan Dungey has faced all season, the reigning champion of Monster Energy AMA Supercross, an FIM World Championship, has won consecutive races for the first time since the third and fourth stops of the 17-race schedule. With a total of seven victories and a podium finish in all 13 races thus far in 2016, Dungey has the first title defense of his career in sight as the championship makes its annual visit to the “Gateway to the West” of St. Louis for the 14th race of the season inside “The Dome” on Saturday, April 16. While Dungey inches closer to a third 450SX Class title, the Eastern Regional 250SX Class has reached historic levels of parity with five different winners through its first five races. With his 29th career 450SX Class win, Ryan Dungey moved into sole possession of sixth on the all-time wins list. Dungey extended his all-time record podium streak to 29 races. Dungey is one win away from equaling the career best season wins total he set last year. He has recorded 15 victories the past two seasons after earning 14 career wins during his first five seasons of 450SX Class competition. For the first time this season Ken Roczen failed to win a race after starting inside the top two. Roczen now has 22 career podium finishes in 43 career starts, meaning he’s been on the box in more than half of the 450SX Class races he’s entered. After he recorded back-to-back finishes for the first time in his career two races ago, Jason Anderson now has a three-race podium streak for the first time in his career. Chad Reed looks to reach another milestone in his legendary career by making his 200th career 450SX Class start in St. Louis. He would join Mike LaRocco and Kevin Windham as the only riders in history to break the 200-start barrier, and would be the first international rider to do so. Aaron Plessinger became the third 250SX Class rider this season to earn his first career win, but is first to do so in the Eastern Regional Championship. Plessinger became the first graduate of the AMSOIL Arenacross Ricky Carmichael’s Road to Supercross to win a Monster Energy Supercross Main Event. 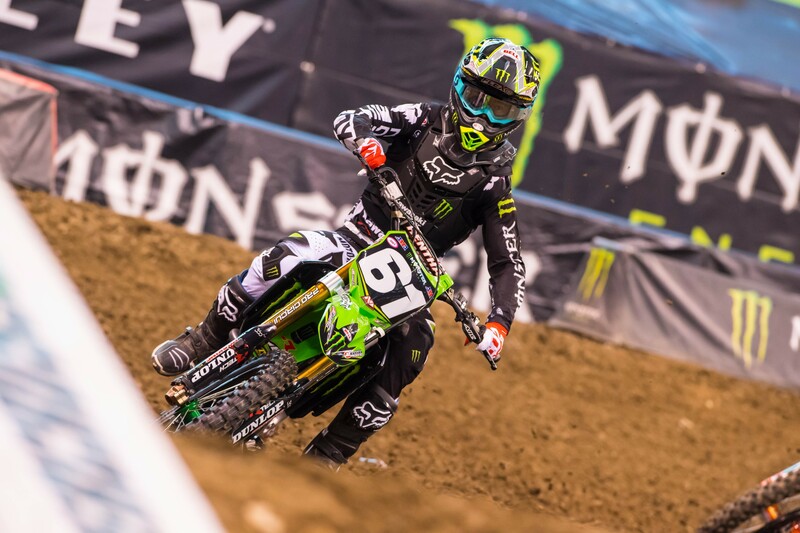 He was also the first Road to Supercross rider to earn an overall win in AMSOIL Arenacross. The Eastern Regional Championship has five different winners in the first five races for the first time in history. This feat has been achieved just once before in the Western Regional Championship, during the 2000 season. St. Louis could bring a slew of Regional Championship milestones for Malcolm Stewart as he will be in search of making his 45th career start and looking to earn his 10th career podium, 20th top five, and 30th top 10. Gannon Audette earned his first career podium finish in his debut outing for Monster Energy/Pro Circuit/Kawasaki. He is riding as a substitute, filling the vacancy left by an injured Arnaud Tonus. Dungey celebrates his seventh victory of the season after a battle for the win against Roczen. The longstanding rivalry between Dungey and RCH Soaring Eagle/Jimmy Johns/Suzuki Factory Racing’s Ken Roczen reached new heights at Indianapolis’ Lucas Oil Stadium this past weekend. The former KTM teammates put on a show for the more than 60,000 fans in attendance, providing what could be considered the most compelling Main Event of the 2016 season thus far. It wasn’t the first time this year that Dungey and Roczen dueled it out for victory, with the German outlasting the champ in Arlington, Texas, and Toronto, but for the past two weeks Dungey has emerged triumphant. In Indy, deteriorating track conditions kept both riders within mere bike lengths of one another throughout the entirety of the Main Event, with mistakes by each leading to several instances of side-by-side competition and pass attempts that brought the crowd to its feet. Roczen was able to successfully make a pass on Dungey late, on Lap 16, but a mistake right before the finish handed the spot back to Dungey, who held of Roczen’s last-ditch push to take his third straight win inside Lucas Oil Stadium. It was Dungey’s 29th career 450SX Class win, giving him sole possession of sixth on the all-time list. And after a surprising three-race stretch in which he went winless, Dungey has returned to dominant form and is in position to clinch the title before the season finale in Las Vegas. He also enters St. Louis as the defending race winner. Dungey’s record 29-race podium streak that dates back to last season has been the key to his supremacy in 2016. Should that streak continue through the remainder of the season, he would amass the most statistically dominant 17-race championship résumé of all time, becoming the first rider to finish on the podium at every race since the schedule expanded during the 2008 season. Four other riders have accomplished this feat, but never over the course of 17 races. Rick Johnson first did it during the 12-race 1986 season, followed by Jeremy McGrath in 1996 when there were 15 races. Ricky Carmichael accomplished the feat twice in 2001 and most recently in 2005 during those 16-race seasons, with Chad Reed doing the same in 2004. It would be just another highlight of what has already been a historic season for Dungey, doing so in what many have considered to be the sport’s most competitive era. Despite missing out on his fourth win of the season, further adding to what is already a career high of wins in a single season for the German, Roczen has done well to keep pace with Dungey and has definitively established himself as the champ’s biggest threat. However, some inconsistent results, including three finishes outside the top five, have put Roczen into a 45-point hole entering St. Louis. 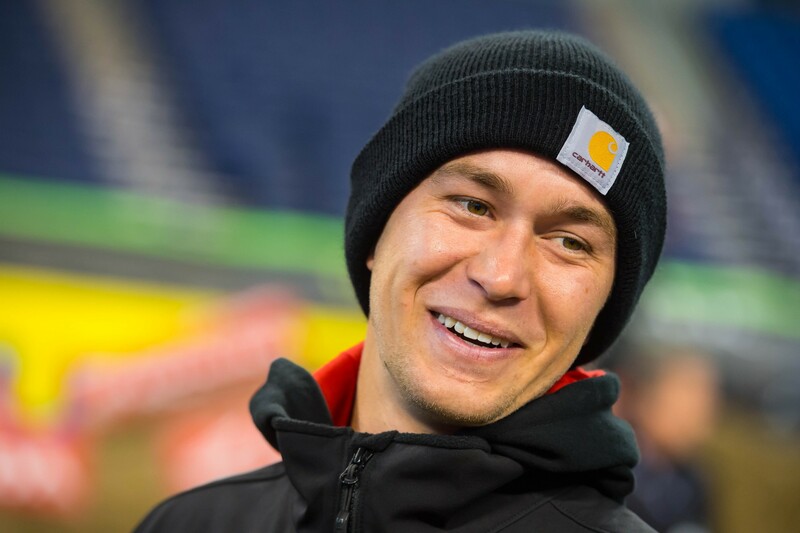 He knows wins will be key if he has any hope of taking the title fight to Las Vegas, and he’s capable of putting the pressure on Dungey as the season winds down, just like he did in Indy. Rockstar Energy Husqvarna Factory Racing’s Jason Anderson completed the podium, producing the same finishing order in the top three for consecutive weeks. Anderson is in the midst of a career-best three-race podium streak, just two races removed from recording consecutive podium finishes for the first time ever. Plessinger got his first 250SX Main Event win of his career at Lucas Oil Stadium. The exceptional start to the Eastern Regional 250SX Class Championship continued in Indy, with Yamalube/Star Racing Yamaha’s Aaron Plessinger becoming the fifth different winner in as many races, while also becoming the 102nd different winner in the history of the division. Entering the race Plessinger was the only rider among the top five in the championship standings yet to win in 2016, but he added his name to the list with a dominant effort. A native of Hamilton, Ohio, it was considered a home race for the second-year rider, who now sits second in the points following his breakthrough victory. A runner-up finish for GEICO Honda’s Malcolm Stewart ensured that he would retain control of the red number plate as the championship leader for another week. He carries a 10-point lead over Plessinger into St. Louis. Monster Energy/Pro Circuit/Kawasaki’s Gannon Audette recorded his first career podium result in third in his debut ride for the legendary team as a fill-in rider for an injured Arnaud Tonus. Audette’s previous career-high finish was sixth. Only once in the history of Monster Energy Supercross has a Regional 250SX Class season started more competitive than this, when the Western Regional Championship opened with six different winners during the 2000 season. Entering Indy five riders sat within 20 points of each other in the championship standings, but as a result of the success from Plessinger and Stewart, combined with misfortune for several of the other top contenders, it has become a two-rider race entering St. Louis as Rockstar Energy Husqvarna Factory Racing’s Martin Davalos, who is third in points, faces a 25-point deficit to the lead. However, given with the unpredictability of this region thus far, anything can happen inside “The Dome” on Saturday afternoon.